The Intersection of Design and Utility Patents - Gottlieb, Rackman & Reisman, P.C. Utility patents are often used to protect the functionality of a product. Design patents are used to protect a product’s ornamental appearance and cannot be used to protect functional elements. But what happens when a functional element is part of the ornamental appearance? A recent case provides some insight. In Sport Dimensions Inc., v. The Coleman Company, Inc., the Court of Appeals for the Federal Circuit wrestled with this question. 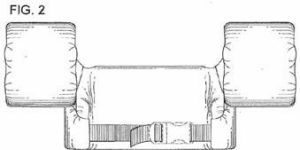 Coleman owned a design patent for a personal flotation device with a torso piece and two arm bands. See Figures below. Sport Dimensions had a product with a similar appearance and filed a Declaratory Judgment action seeking a ruling of invalidity or non-infringement. In the District Court’s holding, the Court found that many attributes of the armbands and torso piece were functional and consequently excluded them from coverage in the design patent. As a result, the overall design for protection did not encompass the armbands and torso piece and, in effect, was invalidated. On appeal to the Federal Circuit, Coleman argued that the presence of functional elements did not preclude design patent protection for the overall design. The Court, citing a variety of cases, reversed the exclusion of the functional attributes from design patent protection. The Court noted that in earlier cases, such as with respect to a multi-functional tool or a surgical instrument, where the basic shapes were dictated by function, there could still be ornamental aspects to the overall design. And in those earlier cases, the structural elements with functional characteristics were not eliminated from design patent protection. The Court also highlighted an earlier-defined multi-part test as to whether a design claim was dictated by function. 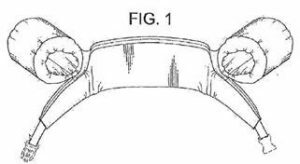 In applying the test, the Court noted that “design patents protect the overall ornamentation of a design, not an aggregation of separable elements.” (citing Richardson v. Stanley Works, Inc., 597 F.3d 1288, 1295 (Fed. Cir. 2010). However, the Court went on to say that even though the functional elements were to be considered a part of the design, because in this case, the functional elements’ contribution is large and the ornamental contribution is comparatively small, the design patent is enforceable, but with limited narrow scope. As a result, clients should recognize that design patent protection covers an overall design, even when portions of the overall design include functional elements. Those functional elements are not removed from the scope of design patent protection. The design patent recognizes a product’s overall appearance, not an element-by-element contribution.